Now you got me wanting bubble tea. Unfortunately, I can’t have the stuff, but my gf loves it. 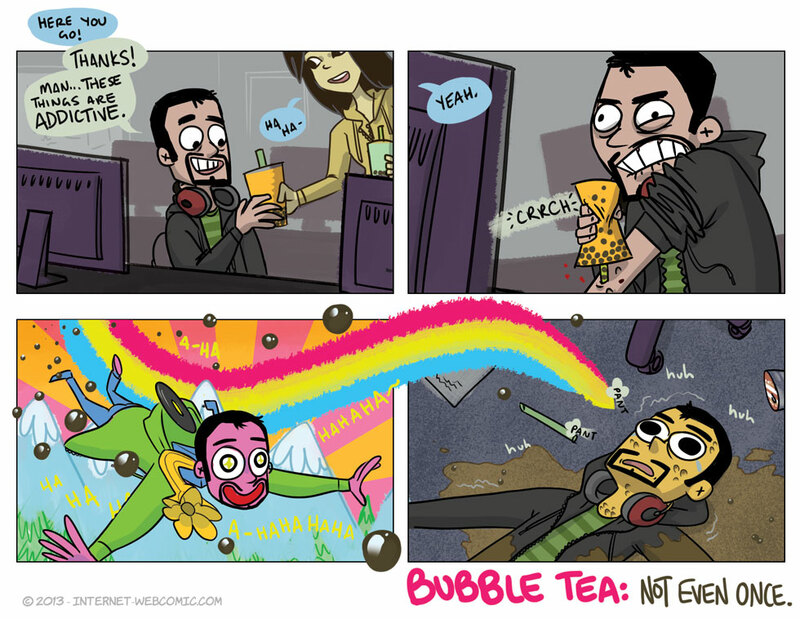 There are too many other drinks I like and bubble tea is too expensive in comparison for me to have ever tried it. Unless it gets cheaper, I more or less expect it to stay that way. And I don’t really feel bad about it. What the hell is Bubble Tea? Sugary drink with tapioca pearls in it. Takes a longer time to drink, so it’s my “sneak this into movies” snack of choice. …… Its more commonly called ‘boba’ here in America, I think. Though there are probably places that call it ‘bubble’, too. I was wondering what the heck “bubble tea” was, but Boba? With that, I am familiar from all the time I spent living in Little Saigon. Alas, here in South Western New Mexico, there is no such thing as… well a whole lot of stuff.